I have to share this news to all of the Music Psychos!-Yes, I am extremely excited! According to the front man of the NYC-based alternative giant, Julian Casablancas, he stated on his Twitter account this morning that "Still not going to be out for a few months-mixing, etc, but JUST finally finished it yesterday actually!?" It's been almost 5 years since the last album, First Impression of Earth came out. Julian has kept teasing fans in regards to the release of the new albums. He even had been forbidden, by the record company, to release any further information earlier this year due to endless delays in the process. I am looking forward to hearing anything off of the new album and I will make sure that you guys are kept up to speed on it's progress and release date !! Stay tuned... 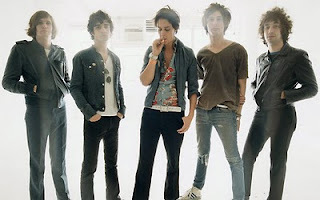 Meanwhile, check out Kanae's show review of the Strokes from last August! !